Pro SQL Server Internals explains how different SQL Server components work "under the hood" and how they communicate with each other. 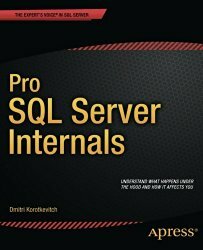 This is the practical book with a large number of examples that will show you how various design and implementation decisions affect the behavior and performance of your systems.Pro SQL Server Internals covers a multiple SQL Server versions starting with SQL Server 2005 all the way up to the recently released SQL Server 2014. You’ll learn about new SQL Server 2014 features including the new Cardinality Estimator, In-Memory OLTP Engine (codename Hekaton), and Clustered Columnstore Indexes. With Pro SQL Server Internals, you have a solid roadmap for understanding the depth and power of the SQL Server database backend, regardless of the version and edition of SQL Server you use.Pro SQL Server Internals does the following:Explains how to design efficient database schema, indexing, and transaction strategies.Shows how various database objects and technologies are implemented internally and when they should or should not be used.Demonstrates how SQL Server executes queries and works with data and transaction logs.